Mrs. Mindy is a certified K-12 art teacher with a B.S. in Art education and has her PA from Kutztown University. She has her certification II plus 15 graduate credits. She has been teaching for 22 years and has been here at St Joan of Arc since 2000. 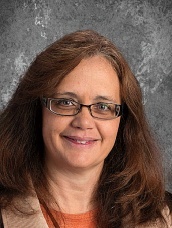 Her students have won several awards including scholastic art award, Diocese of Harrisburg Catholic Art awards, National Environmental Photography awards, and National Aviation contest. Line, shape, primary and secondary colors, texture, and form.